This month Oisin McGann interviews Eoin Coveney. Back in the mid-nineties, I was working in an illustration studio in Dublin among a mix of keen amateurs and a few full-time professionals. Eoin Coveney was one of the more experienced guys, already well set on his career. It was a bit of a mental place, but we were extraordinarily lucky to work with comics grandmaster, Will Eisner, while we where there and Eoin would become the lead artist on one of the biggest projects the studio produced, Ireland: A Graphic History, written by Michael Scott and Morgan Llewellyn. 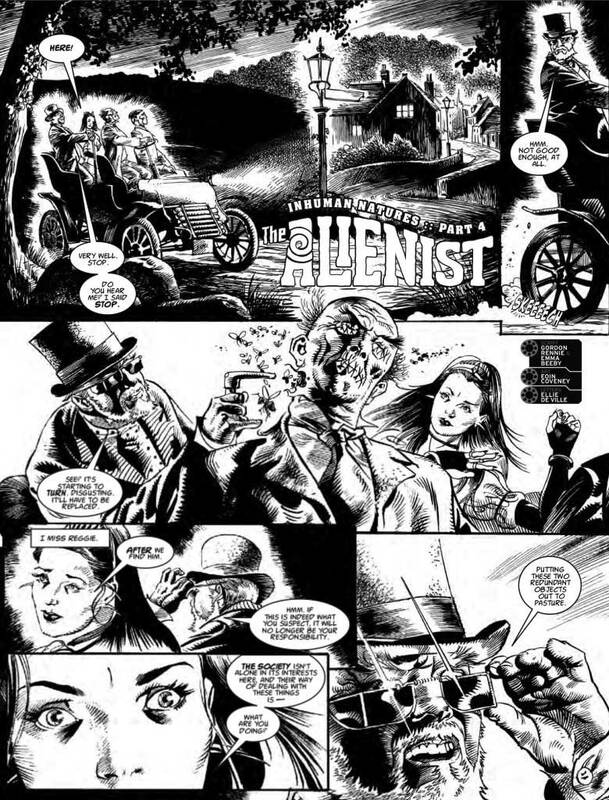 As well as Eisner, he has also gone on to work with comic greats like Gordon Rennie and John Wagner, and divides his time between commercial illustration and comics work, where his enduring, old school style and dynamic storytelling have found a place in 2000AD, among others, as well as earning him a co-creator credit on his latest series for the comic, The Alienist. 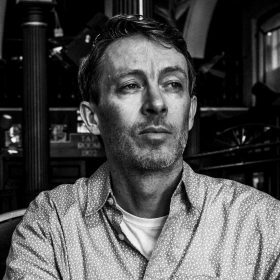 One of Ireland’s true veteran illustrators, Eoin’s commercial clients include FHM, ZOO, Harper­ Collins, Dorling Kindersley, the Irish Independent, Irish Times, Metro London and The Independent in the UK. Eoin, what was your first piece of published work? I guess it has to be a fan drawing in 2000AD in 1983! I won £10 for it. Of course, the thrill of seeing it in print lasted much longer than the money. What first got you into comics and why? Again, 2000AD. I had been aware of war comics as a kid. They didn’t interest me greatly, thematically or artistically. It wasn’t until the arrival of 2000AD and in particular, the cover of prog 3 (featuring a man being eaten by a T-rex and begging to be killed before being eaten!) that I really fell under the spell of the medium. Early influences were Bolland and Redondo. As I hit my teens, the magnificent work of Cam Kennedy on Rogue Trooper became my firm favourite. At first the characters looked boxy and unusual and I couldn’t quite understand the aesthetic. With time, though, I realised what a unique talent he was and the sheer strength of his vision. Around my late teens, Sienkewicz, Moebius and Chaykin were all firm favourites. Lately, the work of Sergio Toppi has begun to influence me. I read the script, during which I begin to see how some panels might look. I read it again and if necessary a third time. After that, I have firm images in my mind for about half the script. The panels that don’t present a mental image are usually the ones that require specific staging solutions. They must be worked out in thumbnail form. Then, I start to gather all my references. After that, it’s onto the graft of pencilling. I try to make my pencils as finished as I can because then it’s onto the fun part- inking. All my work is done on paper with pens and brushes, so that gets scanned at hi resolution and delivered to the client in digital form. Probably it was being asked to draw a one-off story for the Judge Dredd Megazine in 2014 which featured a character originally drawn by my idol, Cam Kennedy. Two Ton Tony Tubbs is a “fattie” and this took up his story, thirty years after his first appearance. I remember loving this character when it originally ran in the prog and to be asked to take up the mantle of drawing this character was both weird and very daunting. Of course, I came nowhere close to his standard but I think I still did a decent take on Tony. 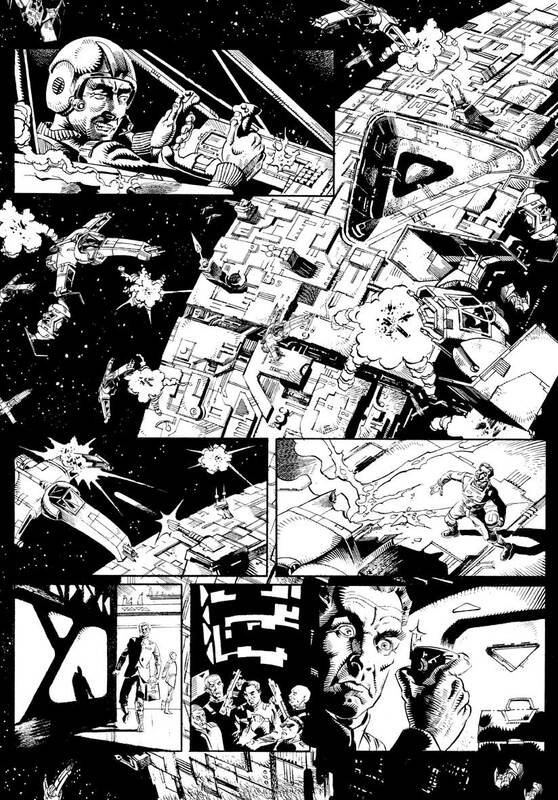 You demonstrated your inking technique in a recent interview with PJ Lynch. I still use a brush or dip pen too and rarely use digital tools for linework. Have you ever been tempted to go digital? I have considered it many times- especially those times when I blot and spoil a wet spot during the inking process! But I feel I am still learning the craft of inking. It’s a mountain I am still climbing. 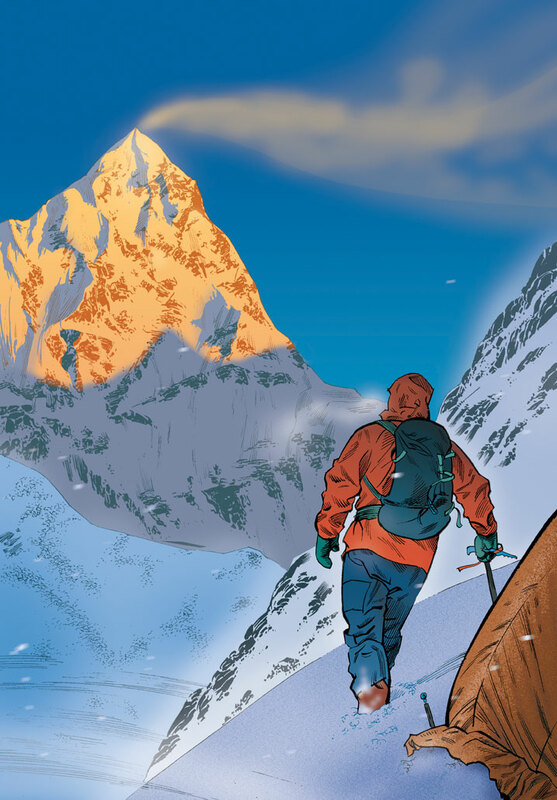 If I ever reach the summit (or at least my limit) and I find software that is a real analogue of the real thing, I’ll be on it like a starving dog! What kinds of problems have you hit along the road as an artist? Being an artist is about problem solving- be they creative, practical or otherwise. The problems I deal with now are different to the ones I faced at the outset of my career. Then, I was consumed by learning the basic crafts of drawing, rendering and storytelling. Now, my biggest problems are less obvious – but no less daunting. I would say the biggest hurdles I’ve had to deal with are the quiet times between jobs, especially during recessions. Thankfully, those phases have been very few and far between but it is tough to suddenly find oneself idle and with too much time to wonder and worry. I have kept myself sane in those times by going back to my anatomy books and working to improve my craft- something which pays dividends when the phone begins to ring off the hook again! 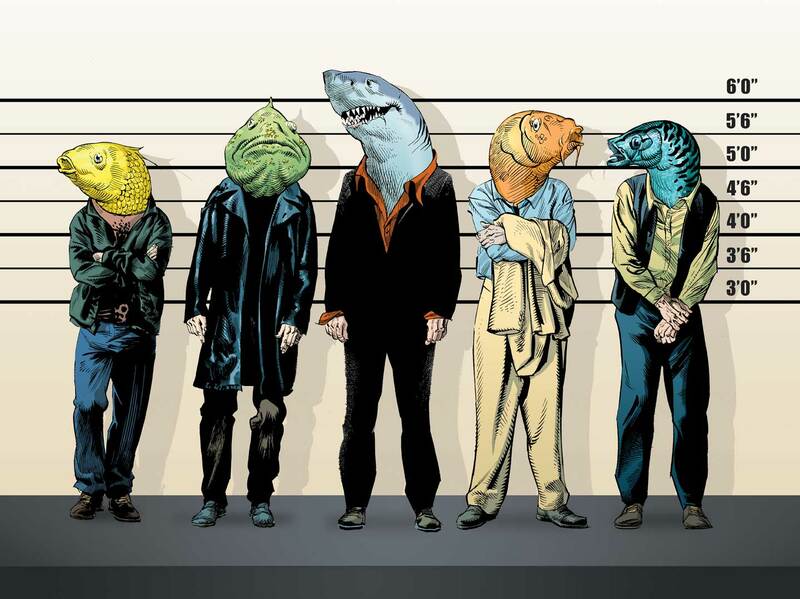 Do you think it’s easier or tougher to get started in illustration these days, and why? I think it’s likely a lot easier to get started, thanks to social media, exhibition spaces and the internet. However, I think it’s probably harder to stand out and get established now than when I began. There are just a lot more people now who want to be illustrators, so it’s much more competitive. Trends come and go with greater rapidity than ever, so it can be hard to focus on what kind of artist you want to be. It’s very easy to be pulled this way and that and lose sight of what’s important – which is, in my view, determination and confidence to stick with what you consider to be worthwhile and beautiful. Trends come and go but you have a better chance of success if you possess a certain bloody-mindedness and remain true to what you believe in. I’ve put so much energy into this, it’s hard to imagine having done anything else. But, it would have been something else creative- probably music or music production, I would say. Valuable experiences are sometimes not obvious when they happen; some are. Years ago, I recall Will Eisner telling me I needed to “loosen up.” At the time, I was bewildered at what he might mean but with time, I can see precisely what he meant and how right he was. A valuable experience can be that one job where a lingering difficulty with some element of drawing suddenly clicks. Sometimes it can be a sentence spoken by a trusted fellow creative that can unlock something. Being open to them is important but one has to balance it against listening to any advice from anyone. Not every piece of advice given necessarily has good intentions. It changes from year to year. In the past, I’ve generally been less than pleased with work of mine that is more than two years old but in the last few years, that has lessened somewhat – hopefully that means I have reached a certain level of confidence and ability. 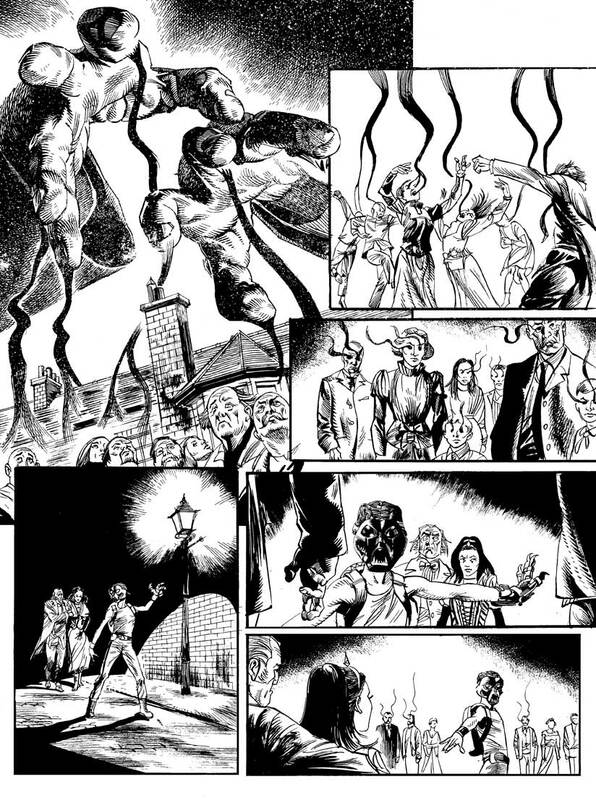 At the moment, I would say that the last series I drew for 2000AD, The Alienist: Inhuman Natures is the work I’m most consistently satisfied with. But I may be cringing at some of it in a few years- who knows! At the moment, I am providing artwork for a board game for a client in the U.S. After that, I have a graphic novel project lined up to begin in the new year.